In a way, turtle evolution is an easy story to follow: the basic turtle body plan arose very early in the history of life (during the late Triassic period), and has persisted pretty much unchanged down to the present day, with the usual variations in size, habitat, and ornamentation. As with most other types of animals, though, the turtle evolutionary tree includes its share of missing links (some identified, some not), false starts, and short-lived episodes of gigantism. Before discussing the evolution of genuine turtles, it's important to say a few words about convergent evolution: the tendency of creatures that inhabit roughly the same ecosystems to develop roughly the same body plans. As you probably already know, the theme of "squat, stubby-legged, slow-moving animal with a big, hard shell to defend itself against predators" has been repeated numerous times throughout history: witness dinosaurs like Ankylosaurus and Euoplocephalus and giant Pleistocene mammals like Glyptodon and Doedicurus. This brings us to the placodonts, an obscure family of Triassic reptiles closely related to the plesiosaurs and pliosaurs of the Mesozoic Era. The poster genus for this group, Placodus, was an unremarkable-looking creature that spent most of its time on land, but some of its marine relatives--including Henodus, Placochelys, and Psephoderma--looked uncannily like genuine turtles, with their stubby heads and legs, hard shells, and tough, sometimes toothless beaks. These marine reptiles were as close as you could get to turtles without actually being turtles; sadly, they went extinct as a group about 200 million years ago. Paleontologists still haven't identified the exact family of prehistoric reptiles that spawned modern turtles and tortoises, but they do know one thing: it wasn't the placodonts. Lately, the bulk of the evidence points to an ancestral role for Eunotosaurus, a late Permian reptile whose wide, elongated ribs curved over its back (a striking adumbration of the hard shells of later turtles). Eunotosaurus itself seems to have been a pareiasaur, an obscure family of ancient reptiles the most notable member of which was the (completely unshelled) Scutosaurus. Odontochelys prowled the shallow waters of eastern Asia about 220 million years ago; another important prehistoric turtle, Proganochelys, pops up in the western European fossil record about 10 million years later. This much bigger turtle had fewer teeth than Odontochelys, and the prominent spikes on its neck meant that it couldn't fully retract its head under its shell (it also possessed an ankylosaur-like clubbed tail). Most important, the carapace of Proganochelys was "fully baked": hard, snug and pretty much impervious to hungry predators. By the early Jurassic period, about 200 million years ago, prehistoric turtles and tortoises were pretty much locked into their modern body plans, though there was still room for innovation. The most notable turtles of the Cretaceous period were a pair of marine giants, Archelon and Protostega, both measuring about 10 feet long from head to tail and weighing about two tons. As you might expect, these giant turtles were equipped with broad, powerful front flippers, the better to propel their bulk through the water; their closest living relative is the much smaller (less than one ton) Leatherback. The turtles mentioned above all belong to the "cryptodire" family, which accounts for the vast majority of marine and terrestrial species. 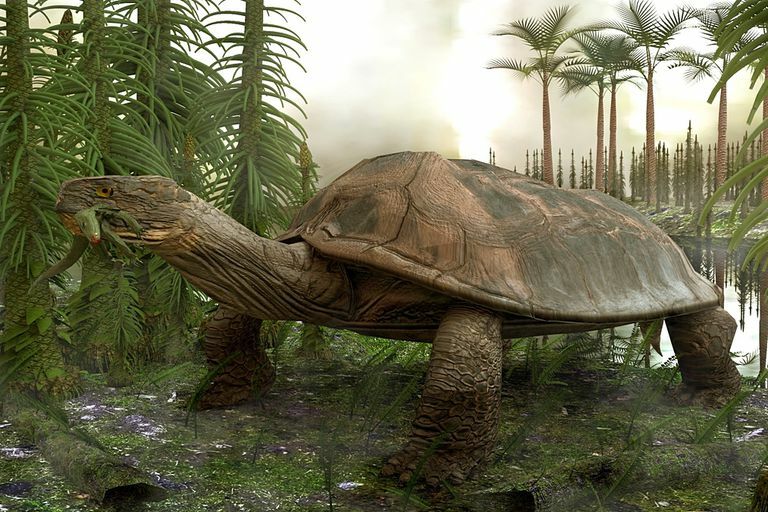 But no discussion about prehistoric turtles would be complete without a mention of the aptly named Stupendemys, a two-ton "pleurodire" turtle of Pleistocene South America (what distinguishes pleurodire from cryptodire turtles is that they pull their heads into their shells with a sideways, rather than a front-to-back, motion). Stupendemys was far and away the largest freshwater turtle that ever lived; most modern "side-necks" weigh about 20 pounds, max! And while we're on the subject, let's not forget the comparably ginormous Carbonemys, which may have done battle with the giant prehistoric snake Titanoboa 60 million years ago in the swamps of South America.